Shaun White, Lindsey Vonn and Shani Davis all struck gold on Wednesday as the United States transformed a bleak Vancouver Olympics into their own winter wonderland with a dazzling show of gravity-defying stunts, brute strength and old-fashioned courage. 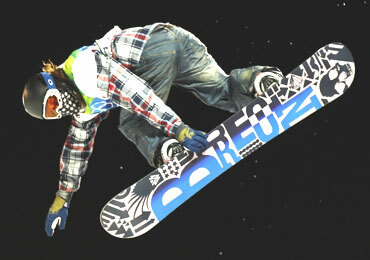 White showed why he is one of the most recognisable and highest paid athletes in winter sports as he wowed a new generation of Olympic fans at Cypress Mountain with a breathtaking display of somersaults, twists and aerial tricks. The flame-haired 23-year-old from California was so dominant that he had the gold wrapped up after his first run so used his second to unveil a special double backward flip he had never performed in competition before. "I just felt like I didn't come all the way to Vancouver not to pull out the big guns," said White, whose cult-status among snowboarders and skateboarders has earned him the nicknames 'The Flying Tomato' and the 'Animal'. A fearless Vonn overcome a painful injury that almost ruined her Olympic dream before it began as she hurtled down a treacherous Whistler mountain course to become the first American to win the women's downhill, one of the most spectacular and dangerous events at the Olympics. A week ago, Vonn hobbled into Canada with a shin injury that prevented her from hitting the slopes but summoned up the determination to fly down a slippery slope that brought some of her main rivals to grief. "I had to attack and I did that. I made it down," Vonn said. "It's awesome, it's all I ever wanted." 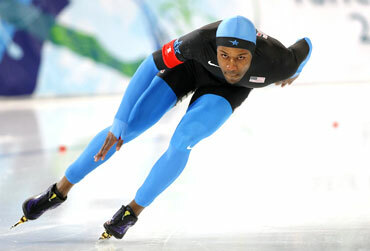 Davis powered home over the final lap at the Richmond Olympic Oval to become the first man to win the 1,000 metres speed skating title at successive Olympics as the US soared to the peak of the medal standings. Davis made it back-to-back wins when he beat South Korea's 500m speedskating champion Mo Tae-bum by 0.18 seconds while Nikita Kriukov won the men's cross country sprint classic after lunging across the line to beat his Russian team mate Alexander Panzhinskiy in a photo-finish. The three victories gave the powerful team a total of five gold medals after the fifth full day of competition, ahead of Germany, South Korea and Switzerland, who each had three golds on a day when the heavy snow falls and thick fog that forced the postponement of some earlier events finally gave way to clear blue skies. Traditional powerhouses Russia, Norway and Austria all opened their gold medal accounts on Wednesday while China won their second in Vancouver and Slovenia's Petra Majdic won the admiration of everyone with her brave third-place finish in the women's cross country sprint classic. Majdic was urged by doctors to pull out of her event after she tripped and fell in a deep hole during a morning training run, badly bruising the muscles around her ribs. 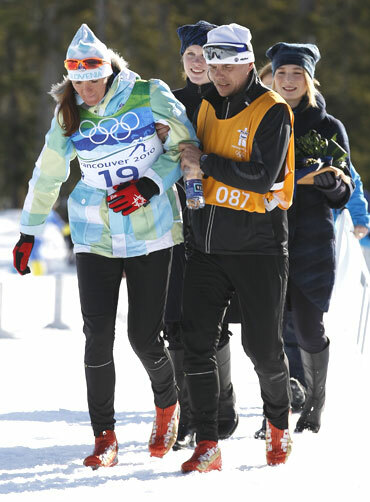 She could hardly breathe but ignored the medical advice and got back on her skis and made it through to the final, which she finished in so much pain that she collapsed on to the snow and needed help just to get on the medal podium. "I won not only a bronze medal for myself, this is a gold with little diamonds on it," she said. Sweden's Anja Paerson missed out on a likely silver medal after falling heavily on the final jump and Romania's Edith Miklos was airlifted from the course by helicopter after a high-speed crash into the safety netting. Norway won gold in the women's final when Marit Bjoergen surged to victory and Wang Meng of China retained her title in the women's 500m short track speedskating final. 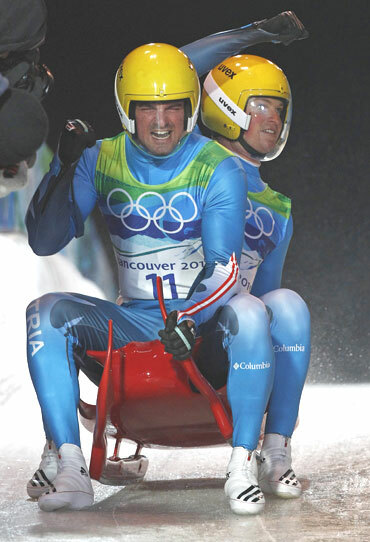 The Austrian brothers Andreas and Wolfgang Linger slid to victory in the luge doubles, repeating their feat of four years ago. The Lingers, one of four sets of siblings in the last luge event, jumped for joy after edging out Latvians Andris and Juris Sics to land Austria's first gold medal of the Games. It was a close-run thing, however, with just a slither of ice separating the podium places. The Lingers' winning margin was 0.264 seconds and Germany's Patric Leitner and Alexander Resch, who took the bronze medal, were less than a tenth of a second away from silver after a storming second run lifted them up from fifth.